It is small window that will be displayed with a Always-On-Top property, but if the client GUI was not loaded yet (e.g before user login) then the old alert window will be displayed by NG service. With this dialog I've tried to make it easier for users to configure their executables and rules with just a few clicks. An automated scan for all existing exes and put on a easily viewable trusted whitelist would be a good addition. Automated scan is unnecessary, because NG will group installed programs automatically, so in a common PC most executables will be added. And automated scan for all executables takes a lot of time which is not good. Regarding viewable white list, its a good idea and can make everything more clear to user too. Added to wizard to-do list. Maintaning a white list is a very hard job if you don't have some kind of community share. Was sorta meaning an auto scan of your own PC's exes to place on an easily viewable and editable whitelist. A community whitelist would just be far too big. Yes, you will see a list of scanned executables, so you can choose trusted ones from list. But this time more organized and unlike previous versions there will be no hidden trusted executables. MaB, if I had a programming and graphic team then you could see link to beta 3 in the next post, but unfortunately I'm working alone and it takes quite some time for the GUI to be ready. Hopefully it will have ring 0 protection and will protect itself aganst all types of termination. Here is a link to a few tests. New GUIs are very pretty and helpful. 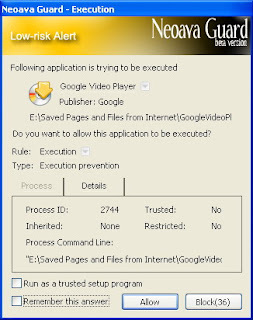 -3- increasing protection of executable other than NG by NG ... i.e. the ability of NG to stop termination attacks on other processes. I want to pick the occasion in order thank you for your wonderful security software that I consider the best one than all both free than expensive. Thank you very much J. How's it progressing Arman?Release soon hopefully.